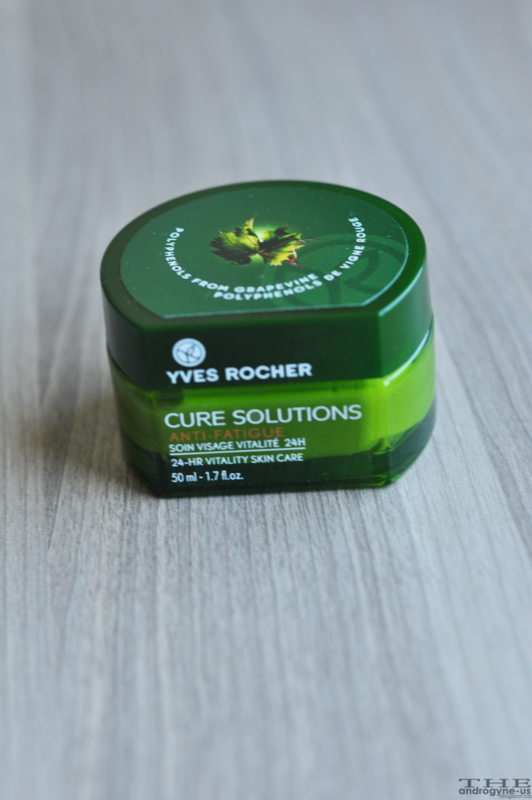 Originating from France, the brand Yves Rocher, if many of you don't know, are known for its plant-based products. I still have the mirror lip glosses from the first time the store opened at West Edmonton Mall two to three years ago. 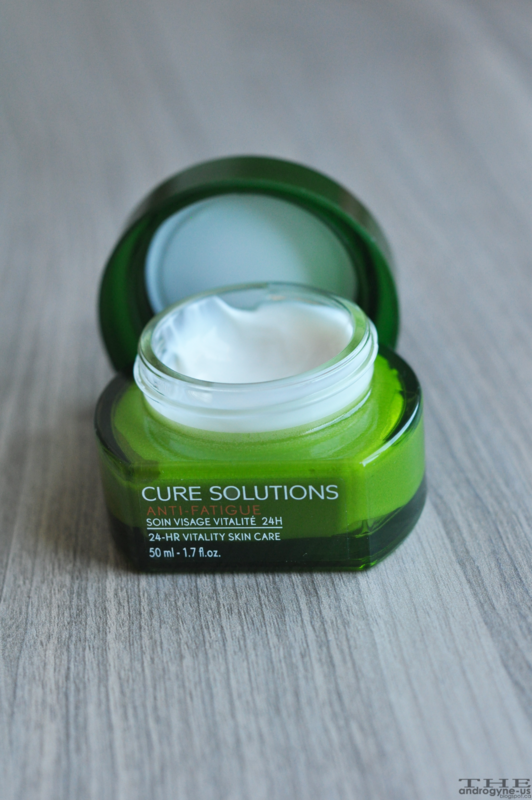 Today, I have chosen one of their best-selling creams to review. This cream promises a lot...but it wasn't for me. In short, this cream broke me out, and I would love to find out why, but the ingredients are not listed anywhere. Actually, maybe it was listed on the box, but I threw that away long ago and unfortunately, they are not listed on the website. I love the color of the container - it just looks so promising! Most people comment on the cream having an overpowering smell, but I think it smells really good (like wine but not). The texture is a bit weird, I would say it spreads well but not something I would choose as a base for make-up - it did not sink into my skin quickly and came off a bit waxy. This cream made me so oily within half an hour, which was a definite first for me. I remember somewhere on the box, I was told to use this for one month straight (day and night) to see results, but my skin rejected this cream completely. Basically, the skin under my eye became super itchy and red (as well as having bloodshot eyes), I have a hunch that it contains mineral oil. I gave it a week to try, but I started to get red spots on my cheeks, and my skin started to yellow (I am normally quite pale, yellowing on me is a sign of toxicity). I ended up giving this to C as she has less sensitive skin, and things that do not work for me, usually work wonders on her. Thankfully, I got this as a freebie. P.S. Hi to all our wonderful new readers! P.S.S. yves rocher is having a 50% off sale, do have a look! Another useful skin care beauty tip to remember is making sure that your body has sufficient amount of vitamins. Mary Crosland Eating foods that are rich in vitamin A, C & F is as important as your daily cleansing and moisturizing routine. These vitamins not only help your skin maintain a healthy complexion, but also help the rest of your body. Besides eating foods, these vitamins can also be obtained through supplements. This is real take it serious, i am Spencer curry i am from USA. Who will believe that a herbal medicine can cure HPV, i never believe that this will work, i have spend a lot money getting drugs from the hospital to keep me and my son healthy, it got to a point that i was waiting for a death to come because i was broke, one day i hard about this great man called Dr.Ose who is well know for HPV, Herpes, and Cancer cure, i decided to email him I didn't believe him that much, I just wanted to give him a try, he replied my mail and Needed some Information about me, then I sent them to him, he prepared a herbal medicine (CURE) and sent it through Online Courier Service for delivery, he gave my details to the Courier Office. they told me that 7 days I will receive the package and after receiving it, i took the medicine as prescribed by him at the end of the two weeks, he told me to go to the hospital for a check up, and i went, surprisingly after the test the doctor confirm me HPV simplex virus negative, and my son an i thought it was a joke, i went to other hospital and was also negative, thank you for saving our life's, I promise I will always testify of your good works. if you are HPV simplex virus patient, contact him and I am sure you will get cured, contact him via: droseherbalhome333@gmail.com OR whatsapp him on his number +2347031150298.